The latest street banners, to grace the neighbourhood of South Granville, features a colourful work of art from the acclaimed Canadian, contemporary artist – Sylvia Tait. Look up to admire Tait’s SunSong, based on an abstract painting that was a part of the Double Entrendre exhibition at Bau-Xi Gallery in November 2017, which celebrated forty years of representation by the gallery. Since the 60s, South Granville has been synonymous with art and is home to the city’s original Gallery Row. 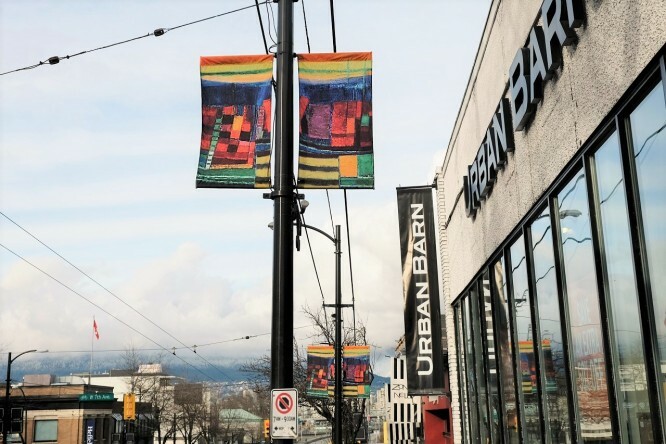 As one of Vancouver’s top art gallery enclaves, our neighbourhood continues to support a strong connection to art and local artists through our ongoing banner initiatives, which began in 2000 with Sylvia Tait as the first featured artist. Other artists that have been showcased over the years include: Don Yeoman, Larry Russo, Maxwell Newhouse, Francis Graval, Li-Leger, Glen Payne, and many more. The banners are on display for your enjoyment along Granville Street between 6th and 16th avenues throughout the year. 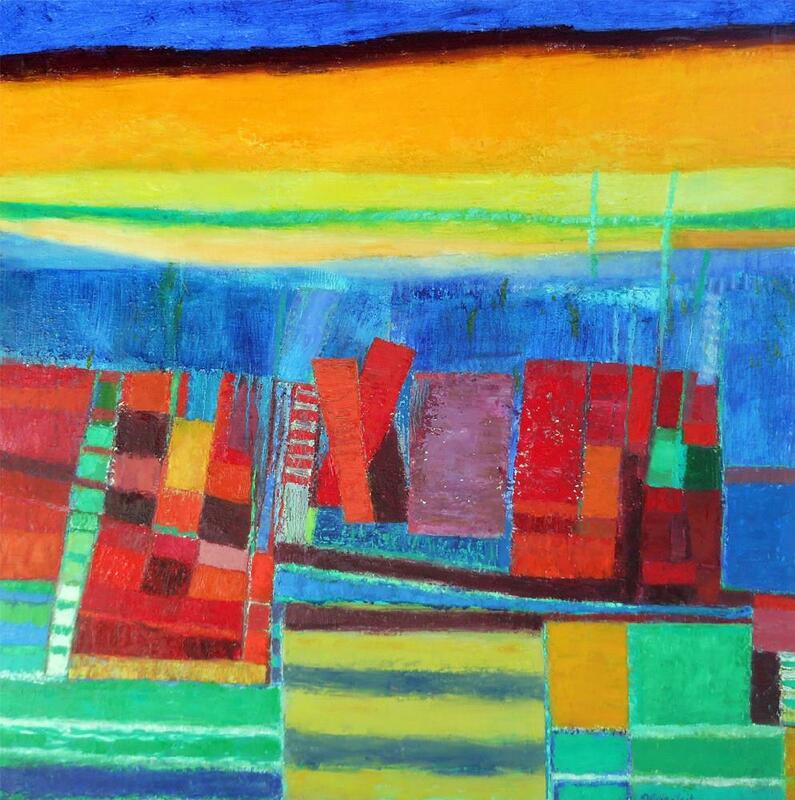 Sylvia Tait’s paintings are widely appreciated for their relationship of colours, fragmented forms and expressiveness. 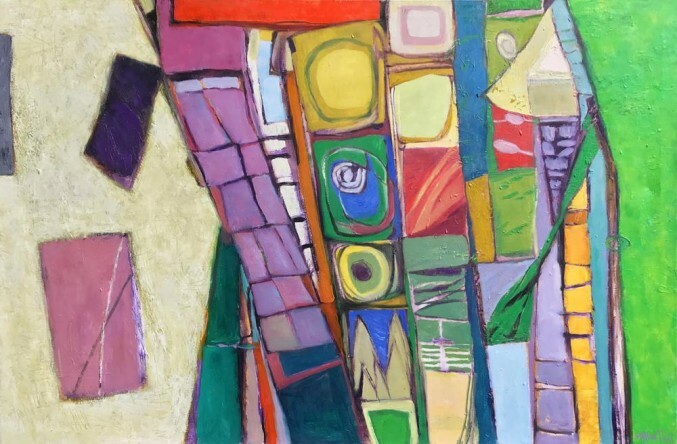 She is largely known as one of the West Coast’s most recognized abstractionists with a focus on the rhythmic complexity and boldness of saturated colours. Her passion for classical music and her poetic sensibility are intertwined in her multi-faceted approach, with musical references in many of her art titles…Sunsong being an example. Originally from Montreal, Sylvia Tait has been a long-time resident of Vancouver since 1968. She has been exhibiting her work for over sixty years across Canada, Mexico and Ecuador. Her paintings can be found in public and private collections around the world. See here for more examples of her work. The South Granville Business Improvement Association wishes to warmly thank Sylvia Tait for contributing her art to our latest street installation.